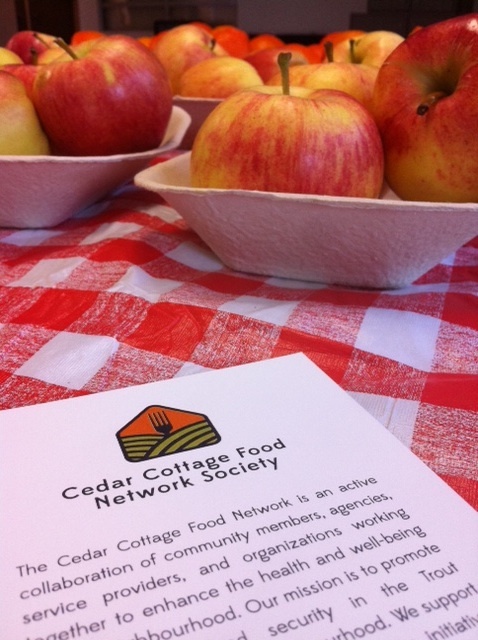 The Cedar Cottage Food Network Society (CCFN) is an independent, non-profit organization working toward more sustainable and just food systems at the neighbourhood level. We create space for Kensington-Cedar Cottage residents to take part in different levels of food systems by providing programming, tools, and opportunities for community connections. The neighbourhood we serve is Kensington-Cedar Cottage, which runs north to south from Broadway to 41st, and west to east from Fraser to Nanaimo. To enhance the health and well-being of vulnerable populations in the Cedar Cottage neighborhood by supporting and coordinating local food security initiatives and improving access to community health, social services and community-based programs. The Cedar Cottage Food Network supports residents of the Kensington-Cedar Cottage neighbourhood to build knowledge, access community resources and food that is safe, nutritious, affordable, personally/culturally appropriate, and sustainably produced on a consistent basis. We are one of several Neighbourhood Food Networks that exist in Vancouver. Together, we are helping the City of Vancouver reach its goal of becoming the Greenest City in the world by 2020. Our programs are generously supported by Vancouver Coastal Health, the City of Vancouver, and Decoda Literacy. We acknowledge that our work takes place on the unceded*, ancestral territories of the Coast Salish peoples. This includes the traditional homelands of the Musqueam, Skxwú7mesh-ulh (Squamish), Stó:lo, and Tsleil-Waututh nations. * Unceded means that this land was never surrendered, relinquished, or handed over in any way.